The use of the term "Miniature Beagles" is almost a misnomer. The term refers to one of two size classes recognized by the American Kennel Club. The AKC recognizes two varieties of Beagles. The 13-inch Beagle variety includes all Beagles that stand 13 inches or less at the shoulder. The 15-inch Beagle variety includes all Beagles over 13 inches and up to 15 inches at the shoulder. It's the 13-inch Beagle that is sometimes referred to as a miniature Beagle. Long before the great illustrator and cartoonist Charles Schultz ever penned Snoopy, America and the world-at-large has regarded the Beagle as a favorite in their hearts and homes. The Beagle is counted as a member of the Hound group by the AKC, and has been used throughout the years as a hunter of rabbits and other small game. Although Beagles have been in existence for over 2,000 years, the English are credited with rescuing and restoring the breed during the 1800s when it was in danger of dying out. A Beagle looks like a shorter and stockier version of a Foxhound and is known as an indefatigable tracker of small game that is willing to follow its prey's scent for days. These dogs are a favorite family pet in American households, and still a valuable part of many working farms in both the United States and Great Britain. The Beagle can be fawn, tri-colored or black and tan. These dogs can, and do, bay when they have caught the scent of prey and again while trapping it. They are known for their stamina. A Beagle's legs are shorter and the body is more muscular than that of a Foxhound. Miniature Beagles weigh between 18 to 20 lbs. Their head and muzzle is more rounded, and their ears are longer to help "cup" the scent from the ground closer to their head and nose. Beagles are known as loyal and faithful companions. Due to their tendency to form an immediate rapport with humans, they are not considered a great guard dog, but their even temper and amiable good nature makes most of them good family dogs. As with many breeds, the Beagle has been crossbred with other breeds with the aim of producing an even smaller version of the dog. Puggles, the result of crossing Pug dogs with Beagles, are a popular combination. These aptly named designer dogs are cute, but the buyer should be aware that, as with every breed, there are undesirable traits that may surface. 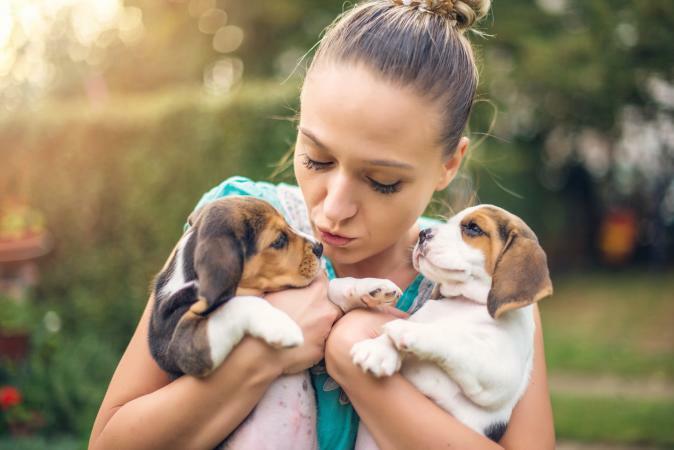 In many cases, miniature Beagles are simply bred down from the smallest specimens of the 13-inch variety, and this in itself can lead to health issues. Beagles do have a recessive gene that can produce dwarfism. Beagles also have a tendency towards epilepsy, hypothyroidism and hip dysplasia. The recognized "miniature" 13-inch Beagle is already a small dog, and given the problems mentioned above, it's already likely as small as breeding and nature intended it should be. Beagles also require some daily exercise. They do well in drag hunting or lure chasing as a competitive sport. A Beagle allowed to gain weight is prone to skin, joint and heart problems. Even though these dogs have short coats, they require regular brushing and even frequent bathing since they like to roll in just about anything to disguise their own scent from their prey. Their ears must be cleaned regularly and kept free of moisture. The faithful and gentle nature of this breed, including so-called miniature Beagles, makes them faithful companions and good therapy dogs. They are even used in airports to scent food and plants prohibited entry to a country. Beagles are usually gentle with children and sturdy enough to withstand the physical attentions of smaller children. However, given their natural instinct to trail scent, Beagles need training - especially training in the basic commands of "come," "sit" and "stay." All Beagles, including miniature Beagles, need a fenced in back yard for exercise as well as training in order to walk nicely on a leash. Since Beagles are innately cute, especially miniature Beagles, there is a tendency among first time owners to spoil them. Beagles are pack animals and will take their behavioral cues from their pack leaders - namely you, their owner. It is easier to train a Beagle from puppyhood than to correct his bad behavior later on.